Six supporters clubs cancel all transport to Friday’s away game in Derry because of ‘genuine’ safety fears. 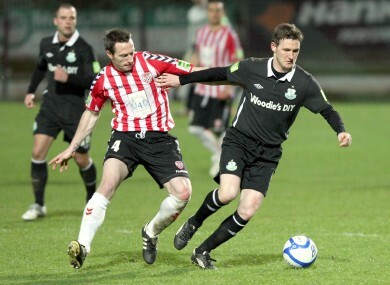 Derry City's Barry Molloy and Gary Twigg of Shamrock Rovers face off during last March's game at the Brandywell, when a Rovers' fan bus was attacked. SIX SUPPORTERS’ GROUPS of League of Ireland champions Shamrock Rovers have cancelled all bus transport to an away game in Derry this weekend over fears for the safety of travelling fans. The six groups said they were cancelling all buses to Rovers’ away tie against fourth-placed Derry City “because of genuine fears for the safety of Shamrock Rovers’ fans” and also because of the potential damage the vehicles could incur. In a joint statement, the six supporters groups said previous attacks on Rovers’ buses at Derry’s Brandywell ground – which they said was a “no-go area” even for the local police – during previous League of Ireland games there. Derry-Rovers matches have seen regular security skirmishes in recent years, with supporters claiming calls for police assistance went unanswered because PSNI officers were unwilling to enter the Lone Moor Road area. A Rovers’ supporters bus was attacked when the sides last met in the Brandywell in March, in a game that ended 0-0. Supporters have urged Derry City to “immediately address” the alarming situation, particularly given its unique status as a club which plays in the FAI’s Airtricity League despite being based in another police jurisdiction. A spokesman for Derry City FC was unavailable for comment. Email “Shamrock Rovers fans cancel NI buses over security fears”. Feedback on “Shamrock Rovers fans cancel NI buses over security fears”.